V2578. 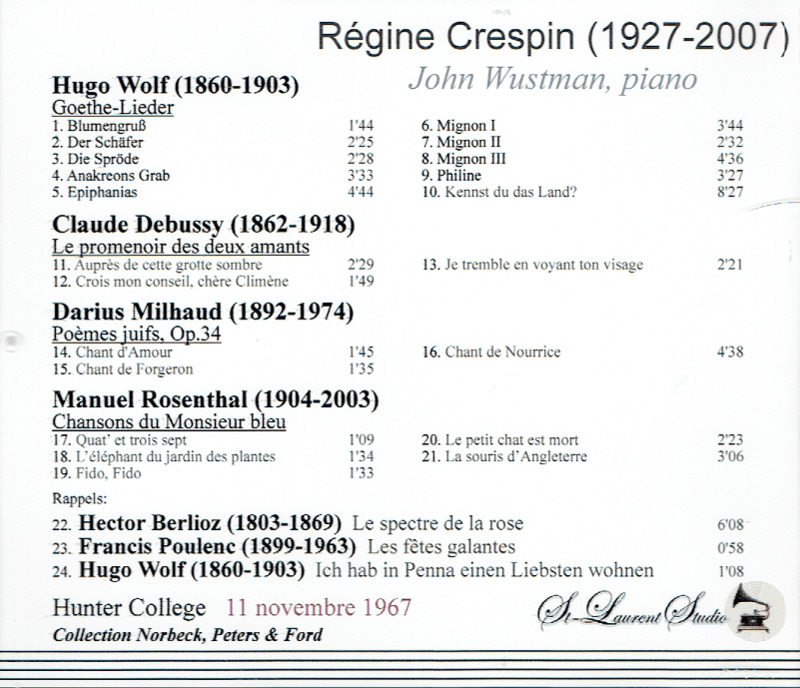 REGINE CRESPIN, w.John Wustman (Pf. 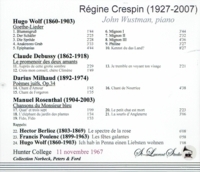 ): Songs by Wolf, Rosenthal, Debussy, Poulenc, Milhaud & Berlioz. (Canada) St Laurent Studio YSL T-741, Live Performance, Hunter College, New York, 11 Nov., 1967. Transfers by Yves St Laurent. 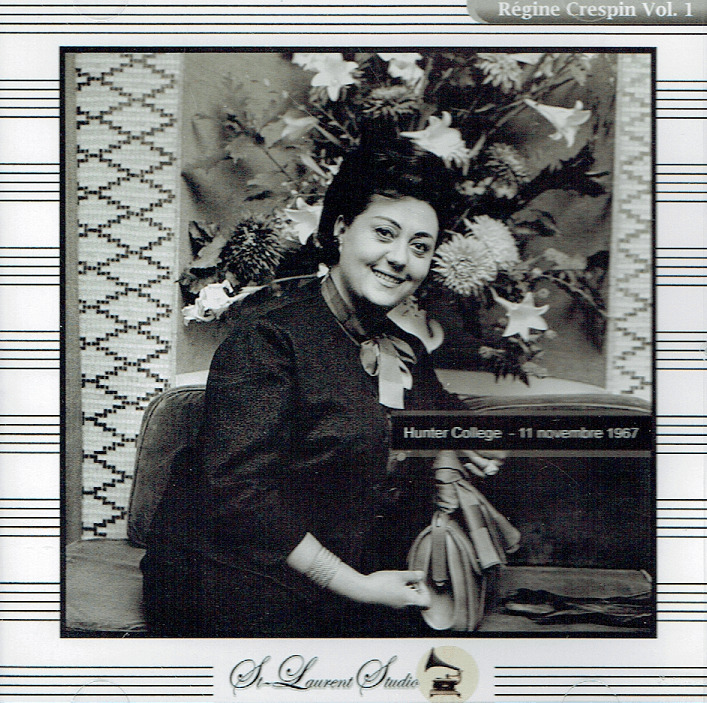 "Régine Crespin, the French operatic soprano and later mezzo-soprano, one of the most important vocal artists to emerge from France in the decades after World War II was widely admired for the elegance, warmth and subtlety of her singing, especially in the French and German operatic repertories. Early on, the natural carrying power of her voice seemed to point to a career as a dramatic soprano. Indeed, she made her 1950 debut at the regional company in Mulhouse, France, singing Elsa in Wagner's LOHENGRIN. Yet Ms Crespin's singing was imbued with nuanced phrasing, telling attention to text, creamy lyricism and lovely high pianissimos. While she had an enveloping voice, she always seemed to keep something in reserve, leading some listeners to sense a touch too much French restraint. But most opera buffs valued Ms Crespin for the effortless richness, lyrical nobility and subtle colorings of her singing. She was also a sophisticated actress whose Junoesque presence commanded attention. Ms Crespin's Metropolitan Opera debut came in 1962 as the Marschallin in DER ROSENKAVALIER, directed by the soprano Lotte Lehmann, who had been the most renowned interpreter of the role. Reviewing Ms Crespin's portrayal, the NEW YORK TIMES critic Harold C. Schonberg wrote that she gave 'a simply beautiful performance' [enriched with] 'all kinds of delicate shading'. But when she let out her full voice, he added, it 'soared over the orchestra and all over the house - big, confident and beautiful'. In 1967 she sang Sieglinde to Birgit Nilsson's Brünnhilde at the Met, with Herbert von Karajan conducting a production that he also directed. Reviewing that performance for THE TIMES of London, the critic Conrad L. Osborne wrote that 'Nilsson and Crespin spurring each other on make for the sort of thing one remembers with a chill for years'. In later life Ms Crespin won wide recognition as a voice teacher. During some 1995 master classes at the Mannes College of Music in New York, the students were enraptured not only by her insightful critiques, but by her insider tales about opera stars."